Study the following Pie-Chart and answer the questions that follow. Following Chart shows the average monthly expenditure of an organization ( In Degrees ) under various heads. Q1. What is the expenditure on Salary. Correct Ans : Rs. 21,60,000. Q2. The expenditure on Telephone is how much more than the expenditure on Water ? Correct Ans : Rs. 2,70,000. Telephone – Water = 50 – 35 = 15 deg. Q3. 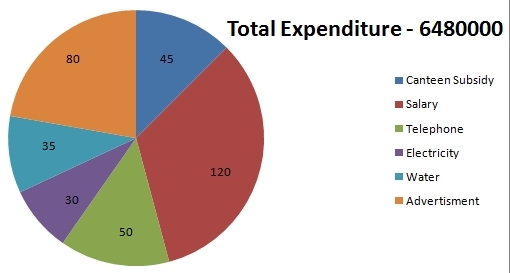 What is the respective ratio between the expenditure on Canteen Subsidy and the expenditure on Advertisements ? Correct Ans : 9 : 16. Q4. The expenditure on Salary is what percent of the expenditure on Telephone and Electricity together ? Correct Ans : 150 %. Required Percentage : [ ( 120 ) / ( 50 + 30 ) ] * 100 = 150 %. Q5. In how many of the following heads was, the expenditure more than 20% of the total expenditure on all the heads of the organization ? 20% Of 360 deg = 72deg. On checking the Pie-Chart we find there are two heads which are more than 72 deg ( Advertisement and Salary ).